Literaturpapst Marcel Reich-Ranicki rightly includes Höhenflugrekord, a classic of the Neue Sachlichkeit, in his influential Der Kanon–Erzählungen . 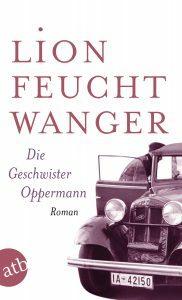 In the Frankfurter Allgemeine Zeitung in 2010, however, he argued that Feuchtwanger’s writing was sometimes “gaudy”. Micha Brumlik, professor of education at the University of Frankfurt, writing in the Jüdische Allgemeine in 2013, values in particular the contemporary relevance of Der jüdische Krieg (see also my paper delivered at the International Feuchtwanger Society Conference 2015, entitled ‘Caught Between Cultures: Lion Feuchtwanger’s Flavius Josephus’). 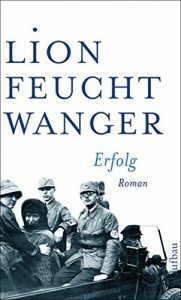 Bayerischer Rundfunk, on the occasion of its 2014 rerun of Dietrich Leube’s TV documentary Lion Feuchtwanger: Geachtet & geächtet, argued that it was with Erfolg that Lion Feuchtwanger staked his claim to immortality. And Ian Wallace, Emeritus Professor of German at the University of Bath and President of the International Feuchtwanger Society, writing for the Forgotten Gems section of the website New Books in German, admires Die Jüdin von Toledo for its portrayal of the mindset behind holy war (a matter of great concern today).